St Patrick’s Cathedral was built in the second quarter of the thirteenth century on the site of an earlier church called St Patrick’s in Insula, its dedication suggesting an association with Armagh. 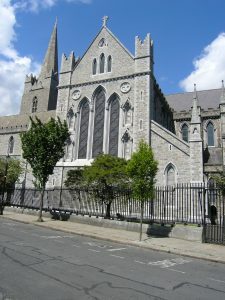 A collegiate church was created here by the first Anglo-Norman archbishop of Dublin, who built his episcopal palace nearby. Soon after it was raised to cathedral status to rival the existing nearby Augustinian Cathedral Priory of Christ Church. Built in the Early English style by English trained masons some decades after the Anglo-Norman invasion in 1169, its architectural influences can be traced to the English West Country. A fully developed plan – aisled nave and choir, east and west aisles to the transepts, an aisled retrochoir and hall-church Lady Chapel – is on a truly European scale. 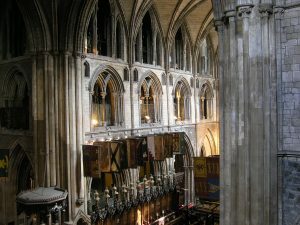 The early adoption of the Sarum Rite for its liturgical rounds not only (arguably) influenced its plan but also the internal layout of the medieval cathedral which was divided up into a number of distinct spaces. Late fourteenth century rebuilding of the west front and the perpendicular flying buttresses of the choir represent the major late medieval changes to the building. The collapse of the nave vault in the early reformation period meant that cathedral services were confined to the choir – which extending into the crossing – for some three centuries. Jonathan Swift, the most famous of the cathedral deans was assiduous in maintaining the fabric. It was the association with the Order of the Knights of St Patrick from 1783 that Gothic Revivalism began to make an impact. A protracted restoration campaign in the 1840s and 1850s along Ecclesiological principles was followed by a well-funded restoration by Benjamin Lee Guinness and further restorations were undertaken by his sons Lords Ardalaun and Iveagh towards the end of the century. 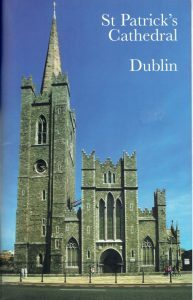 Described by the architectural historian Maurice Craig as our national pantheon, St Patrick’s cathedral, its monuments and precincts, are an integral part of Dublin’s social and architectural history.